• For 3 months (Feb – April) held off Surespan Ltd. from logging in the Chapman Drinking Watershed. 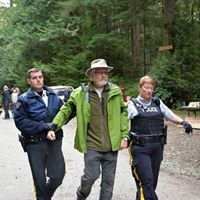 We met them in Supreme Court of BC to defend the public’s right to sustainable sources of water, including intact forest cover that retains, stores and releases water through 4 seasons. We made several presentations to the Sunshine Coast Regional District urging them to issue a referendum seeking taxpayer’s support to borrow funds for the purchase all of Surespan’s private property in the Chapman. 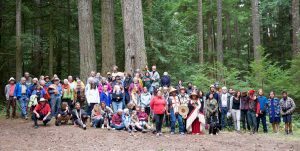 The 3-month roadblock was supported by many of you – our strategy was to buy the SCRD time to get the referendum process in place to appropriate the watershed lands back into the public trust, jointly managed with the shishalh (Sechelt) Nation. We did everything within our powers to make that happen (and spent a fair amount of resources fighting Surepan in court), however at the end of the day, our local elected government chose to do nothing. Relentless logging by Surespan in our drinking watershed continues. 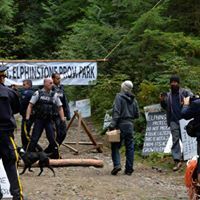 • ELF then took on Peninsula Logging Ltd. holding them off for 3 months (June to September) from logging ‘The Twist and Shout Forest’ within the (proposed) Mt. Elphinstone Provincial Park expansion area. 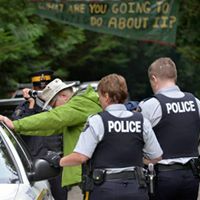 This turned into the largest logging protests the Sunshine Coast has witnessed. The community came out in droves in support of our ‘Elphinstone Protection Camp’ with donations of food, firewood and special events. 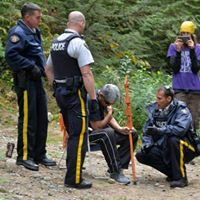 The logging further delayed to allow a BC Forest Practices Board investigation to take place in the very forest that BC Timber Sales had auctioned off to Peninsula Logging. 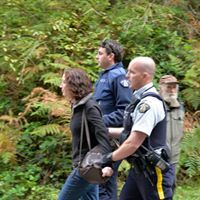 The Forest Practices Board (a government funded agency) agreed that ELF had legitimate concerns over the loss of this Blue-listed endangered forest ecosystem, and negotiated with the logging company to allow the field work to be completed. Their report will be released sometime in 2017 with recommendations to government. 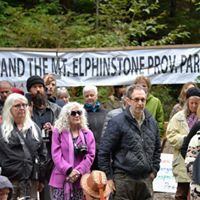 • ELF went to Supreme Court to prevent Peninsula Logging Ltd. using our expert scientific analysis (The Elphinstone Conservation Review) and to challenge misinformation the company wrote in their Affidavits. The Judge presiding denied Peninsula an extension on their first Injunction (which had expired), and he stated that we had a worthy cause. Under the old Injunction, 12 people were arrested, and 100’s peacefully protested. 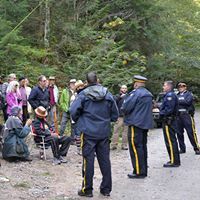 This conflict hit the front page of the Coast Reporter, and a Vancouver Sun Editorial was published stating that the government needs to intervene in this “Renewed War in the Woods”. 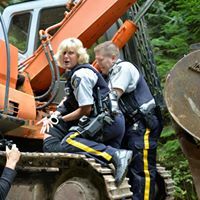 A YouTube video of protesters confronting the feller buncher logging has reached well over 6,000 views. 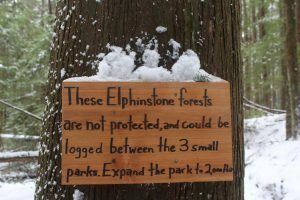 The Sierra Club of BC and Wilderness Committee both issued Press Releases supporting the Elphinstone Park expansion campaign. The Ancient Forest Alliance also printed our releases. 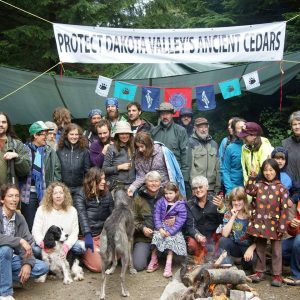 BCTS didn’t listen to this over-whelming support to stop logging, Victoria did not intervene, the courts awarded Peninsula Logging a 2nd Injunction and the forest was lost to logging. • Shaken, but not defeated, ELF went back to what we do best – being out in the Elphinstone park expansion area doing field work. 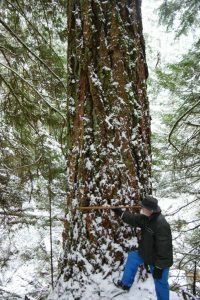 We discovered an amazing stand of old-growth red cedar naming it ‘The Tree of Life Forest’, and located the largest stand of Sitka Spruce on the lower slopes. Each area will get a future trail allowing access for you to access. • We have located an older forest in Wilson Creek Watershed, completing a new trail into ‘The Wilson Fungal & Refuge Forest’. 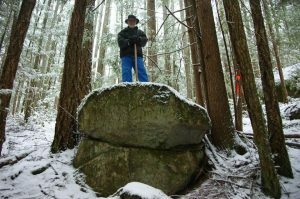 We are lobbying the Sunshine Coast Community Forest to conduct a Roosevelt Elk ‘winter-habitat analysis’ in this area to determine how much intact forest these majestic species require. If they don’t proceed, then ELF will contract the study to an independent biologist. • Going into 2017 ELF will be calling for a moratorium of further cutblocks in the Elphinstone Park expansion area until all stakeholders can meet to come up with solutions so that future conflicts are avoided. There’s also other cutblocks across the lower Sunshine Coast that need to be looked at closely. During this season of giving ELF asks for your support allowing our work to continue into 2017. Donations can be made directly through PayPal at our web site (loggingfocus.org), or by mailing a cheque to ELF PO Box 85, Roberts Creek, BC V0N 2W0. We encourage you to belong to a national environmental group, and to a local front-line group like ELF. We’re good at stretching $50-$100 donations to help pay for public outreach, and research studies. Thank you for sending in your 2017 donation at this time. With the right effort we can collectively work towards key natural forests becoming protected in our region.